Attention, attention! This is a Public Service Announcement from Steve Jackson Games. Listen, for your own good. 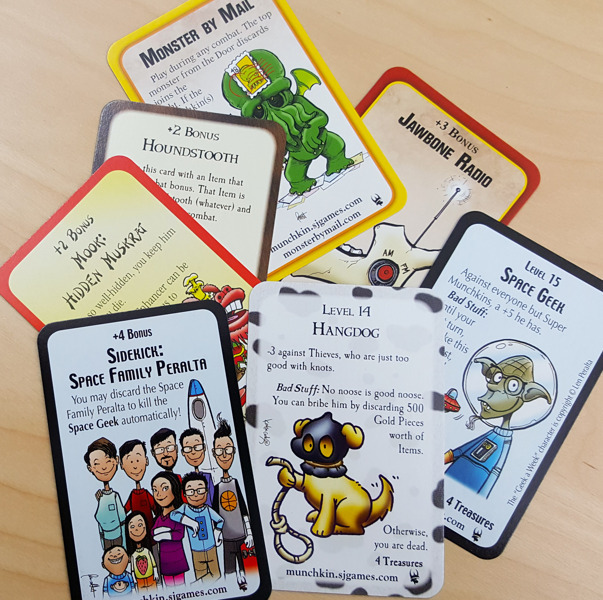 Most of the time, that swag includes a random assortment of promo Munchkin cards. That's particularly cool right now, because there's a brand new crop of never-before-seen promotional cards available. They have themes from Star Munchkin Guest Artist Edition, Munchkin Apocalypse Guest Artist Edition, Munchkin Fu Guest Artist Edition, and classic Munchkin. You could defeat the green, pointy-eared Space Geek, maybe by using the Space Family Peralta. Or call for help on a Jawbone Radio when you're accosted by a Monster by Mail. You may even enhance your items by making them Houndstooth, to take on the Hangdog. Or you might just let Mook: Hidden Muskrat follow you around. Oh, and since we're talking about this, we should also mention that you can buy promo cards from Warehouse 23 if you want a specific one for your game. They're just 50 cents each – that's less than vending-machine chocolate – or less than a load at the laundromat to wash out melted vending-machine chocolate. It's not very much, is the point. You can also get our promo cards at conventions, from one of our Men in Black, or at your friendly local game store! There are so many options for swag, it's not even funny. And that's the end of this Public Service Announcement. Don't start forest fires, try not to litter, avoid hitchhiking bears, and check out Warehouse 23.